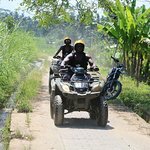 The wild jungle trails, bamboo forests, and rice paddies of rural Bali are a world away from the coastal beach resorts, and the most adventurous way to explore them is by all-terrain vehicle. 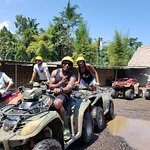 On this quad bike tour, drive your own ATV and venture off-road to see a different side of Bali, passing scenic viewpoints and traditional villages along the way. 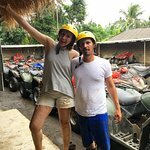 Your half-day adventure begins with pickup from your Bali hotel or cruise port at the tour time selected for a transfer to the departure point by air-conditioned minivan. 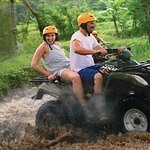 On arrival, meet your guide and have some time to practice driving your ATV before the tour starts. 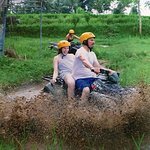 Set out on a thrilling 2-hour excursion, following your guide along narrow rainforest trails and muddy jungle tracks, zipping past tiered rice paddies and lush plantations. 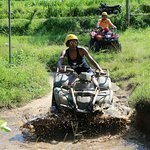 Splash through rivers, tackle tricky off-road sections, and glide through a bamboo forest, stopping along the way to take photos or catch a glimpse of local life in the rural villages. After an adrenaline-fueled tour, return to the starting point, where you have time to shower and change before lunch is served. Finally, your tour ends with a return transfer to your hotel. Was an excellent day out for a teenager. Our driver Ardana was really professional, friendly and a safe driver. 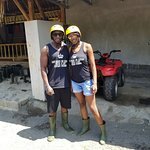 Will definitely do this again. 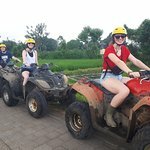 Get quick answers from Bali Quad Bike Adventure staff and past visitors.